FAITHFUL SERVICE DECORATION, FOR FORTY YEARS. 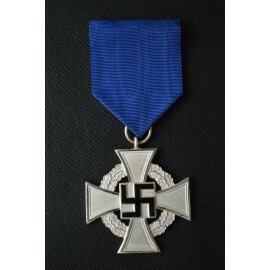 > GERMANY>THIRD REICH - CIVIL AWARDS>FAITHFUL SERVICE DECORATION>FAITHFUL SERVICE DECORATION, FOR FORTY YEARS. A Faithful Service Decoration; 1st Class for Forty Years' - Bronze gilt with black enamels, 41.3 mm, original ribbon with pinback, light contact, box signed OPA RECKL. HAUSEN, extremely fine. 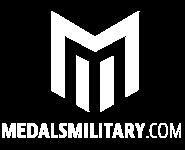 A Faithful Service Decoration; 1st Class for Forty Years' - Bronze gilt with black enamels, 41.3 mm, original ribbon with pinback, light contact, extremely fine, In its case of issue, marked "40" inside a wreath on the cover, medal bed with support divider, scuffed and lightly soiled, extremely fine, marked Deschler & Sohn, Munchen.